Please refer to our stock # 11328 when inquiring. This amazing necklace has such a dramatic look when worn. 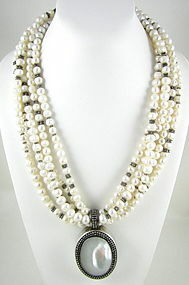 It has 5 strands of fresh water pearls with sterling silver granulated rondelle accents. At the center of the design is a 2" long x 1 5/8" wide x 3/4" thick sterling silver medallion with a mother of pearl front panel. The strands end in a sterling silver toggle closure set with moonstone cabochons. The medallion is hallmarked "Copyright BAC 925", and the necklace is in excellent condition.